Though dozens of small earthquakes shook the ground near Mount St. Helens early Wednesday morning, they were not caused by shifting magma within the active stratovolcano, according to experts. The swarm of tremors began about 12:30 a.m. with a 3.9 magnitude quake striking near Spirit Lake, about 7 miles from the mountain that famously erupted in 1980. Then, the initial quakes were followed by “dozens and dozens” more, according to Bill Steele of the Pacific Northwest Seismic Network. 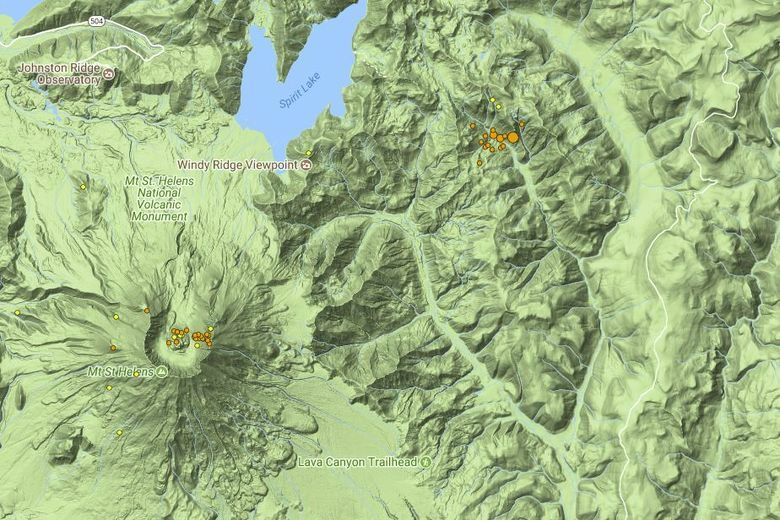 Despite the ample seismic activity, it’s believed to be “pretty normal tectonic activity that just happened to be close” to the mountain, said Seth Moran, the scientist-in-charge at the U.S. Geological Survey Cascades Volcano Observatory. “We don’t think it’s related to Mount St. Helens because the pattern of earthquakes, and the style of how they occur, is very different,” Moran said. Moran said there are actually tiny earthquakes occurring almost continuously in the masses of unseen and uncharted faults that run through Western Washington and Oregon. The pattern of Wednesday’s earthquakes — one large shock followed by a series of weaker aftershocks — is “typical, predictable and not that impressive” for our fault-rich region and does not appear to be related to volcanic activity, Moran said. The quakes are triggered by the stress of the Pacific Plate crunching up against our North American Plate, and, according to Moran, it is not uncommon for us to have earthquakes with magnitudes of 3, 4 or 5 a couple times a year. While authorities said there were no reports of injuries or damage from Wednesday’s tremors, there is a small possibility that a larger quake could follow within 48 hours, Steele said. “Whenever you have an earthquake, there is a very small chance that it could hit another fault that could rupture further,” he said. Moran said the series of small quakes is a great reminder for people that a bigger earthquake can and will happen in our future, and an opportunity to heed the advice that’s out there. “This one was kind of fun, but take it seriously and have two weeks of food and water on hand,” he said.